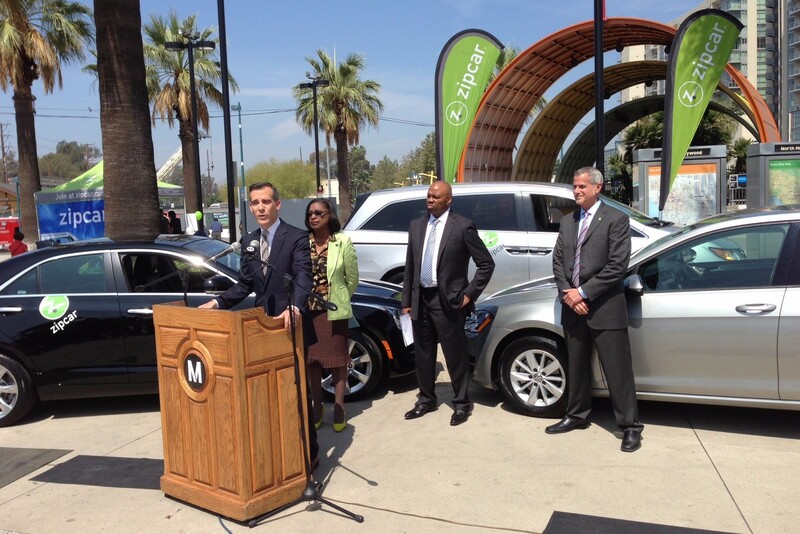 Mayor Garcetti announces Zipcar vehicles are now available at ten Metro station parking lots. Left to right: Garcetti, Jacquelyn Dupont-Walker, Phil Washington, and Dan Grossman. Photos by Joe Linton/Streetsblog L.A.
Last Friday, Metro and Zipcar announced a new partnership that places car-share vehicles at ten Metro station parking lots. The new program was announced via a press conference at the North Hollywood Red Line Station. Speakers included Los Angeles Mayor and Metro Board Chair Eric Garcetti, Metro Boardmember Jacquelyn Dupont-Walker, Metro’s new CEO Phil Washington, and Zipcar Regional Vice President Dan Grossman. The cars are available and ready now. Mayor Garcetti touted $36 billion in transportation investment, but it may be these sorts of high-tech, low-cost, quick mobility wins that will the extend the reach and convenience of Metro’s rail and bus systems into Los Angeles neighborhoods. Examples include Metro bike-share, debuting downtown by early 2016, and LADOT’s fare-payment app. Both Garcetti and Washington emphasized that this new car-share program is part of implementation of Metro’s First Last Mile Strategic Plan, though early action on car-share was prompted by this July 2014 Metro board motion [PDF] by Garcetti, with boardmembers Pam O’Connor and Mike Bonin. Expanding car-share also dovetails with Garcetti’s sustainability pLAn which aims to increase car-share/bike-share/ride-share from its current 0.9 percent of L.A. City trips to 5 percent by 2035. Washington emphasized the need for innovative “mobility on demand” that would seamlessly connect travel by airplane, train, bus, car, bike, and foot. 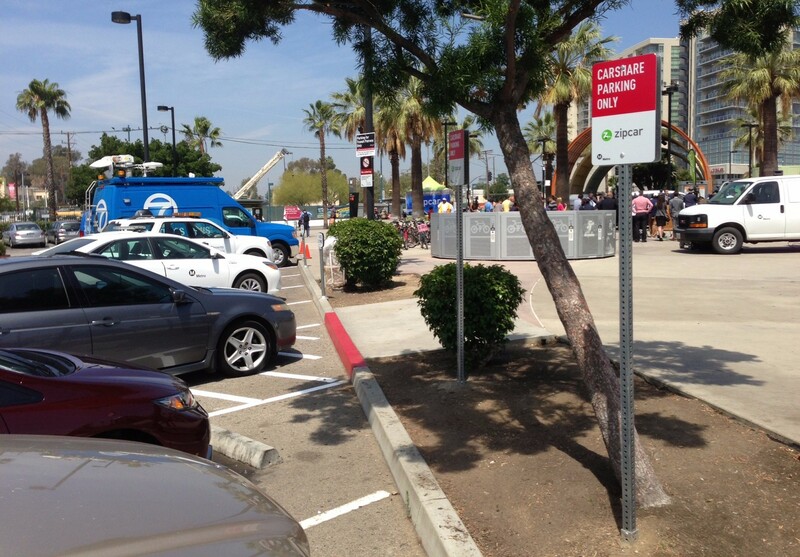 At North Hollywood, the Zipcar parking spots are located in the southern parking lot, very close to the escalators. If you’re coming up the escalator, look for them on the left, just past the bike parking. In other car-share news, in mid-May the Los Angeles City Council approved motion 13-0192 which approves the city of Los Angeles’ initial foray into point-to-point car-sharing. To date, the city of Los Angeles has only seen fixed-location car-share, including the new Metro station Zipcars which must be brought back to their start location after use. Point-to-point car share allows users to make one-way trips and leave the car anywhere within defined service areas. Car2Go debuted Southern California point-to-point car-share in 2014, with 115 cars across multiple South Bay cities, but recently announced the program was being canceled. Car-share has had a sputtering history in Los Angeles, but, with shifting demographics and officials, agencies, and private industry working together, it is likely to play a significant role in L.A.’s broadening transportation mix. And, if these new Metro locations are successful, there’s a lot of potential for growth with Metro’s 20,000+ parking spaces. When I’m visiting LA, this will substantially extend the “reach” I can get to without renting a car for the whole week. It appears Zipcar has now launched a one-way carshare rental option. Instead of a leave-the-car-anywhere-in-this-area model, one has the ability to rent a Zipcar from Location A and return it to Zipcar Location B, assuming the latter has a free space available. Somewhat limiting, but I suppose the system will get better as it matures. Now if only more Metro stations would be given carshare stations…. At the end of today's nearly 6-hour Metro board of directors meeting, the vote on the staff-recommended $547 million multi-agency transit policing contract was pushed back three months. Metro's new transit policing arrangement would scale back the L.A. County Sheriffs Department's current role in favor of a majority of the work being done by LAPD. Metro's Construction Committee approved a motion for short- and long-term improvements to Metro's oldest and busiest light rail line.